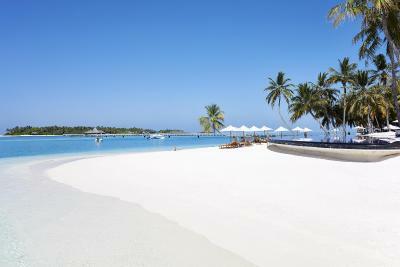 Lock in a great price for Conrad Maldives Rangali Island – rated 9.1 by recent guests! I love the way how staff treated client, It was excellent! Also the villa is very clean and beautiful 👍 This is my paradise place ever. The beach villa room is really beautiful. Nice reef. There were few customers so the atmosphere was pretty calm and silent, which we really enjoyed. Very good breakfast buffet. Ithaa restaurant a real great experience with not only amazing concept but also great food and perfect service ! Worth the price for a special occasion ! Conrad Maldives Rangali Island This rating is a reflection of how the property compares to the industry standard when it comes to price, facilities and services available. It's based on a self-evaluation by the property. Use this rating to help choose your stay! 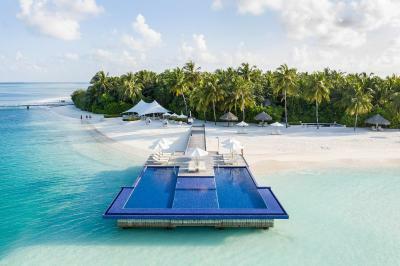 Set on 2 separate islands connected by a bridge, the luxurious Conrad Maldives Rangali Island offers spacious private villas. 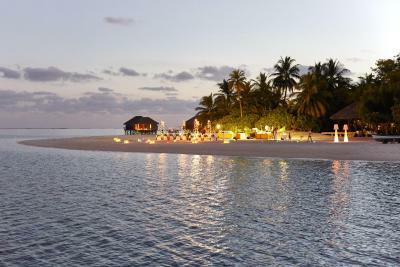 It features the all-glass underwater Ithaa Restaurant and 2 award-winning spas. 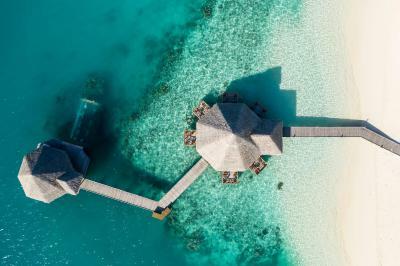 Stretching up to 1,650 feet into the Indian Ocean, Conrad Rangali Island's villas are packed full of creature comforts, including free Wi-Fi, flat-screen TVs and DVD players. Beautiful sea or beach views are framed through wooden floor-to-ceiling windows. Total relaxation can be enjoyed at the lagoon Spa Retreat and Over-Water Spa. 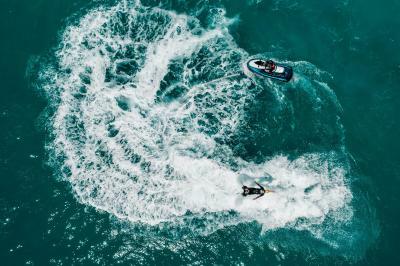 Guests may make their stays extra rewarding by visiting the on-site Italian boutique, or learning about local culture on a day trip to one of the surrounding islands. 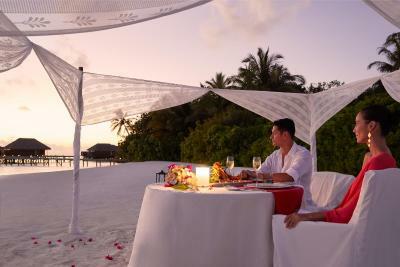 Conrad Maldives' 12 world-class restaurants and bars serve an assortment of international, Mediterranean and grilled dishes. 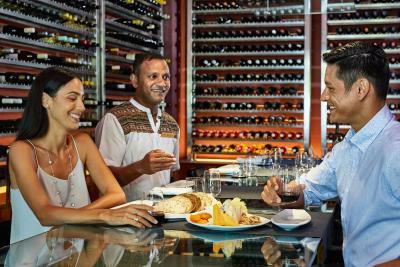 Over 600 bottles of premium wine can be enjoyed at The Wine Cellar. 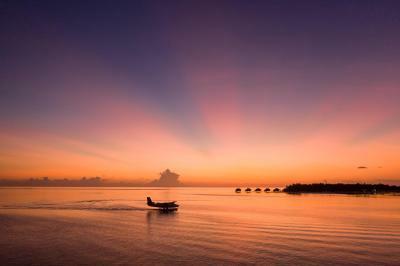 Conrad Maldives Rangali Island is reachable via a 30-minute scenic seaplane transfer from Male International Airport. 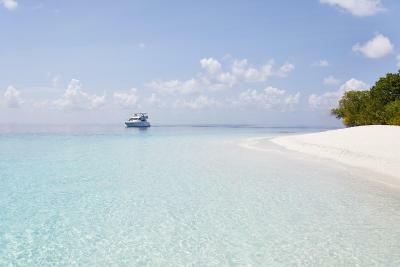 When would you like to stay at Conrad Maldives Rangali Island? Set on the beachfront, all Beach villas feature a glass-walled bedroom that opens up to a terrace with private grounds providing direct access to the beach. The courtyard comes with an open-air garden bathroom with thatched-roof bathing pavilion that has an oversize bathtub. Villas are also furnished with wooden lounge chairs, flat-screen satellite TV, stereo with iPod connectors, DVD player and Nespresso tea/coffee machine. Aromatherapy Associates toiletries are provided. 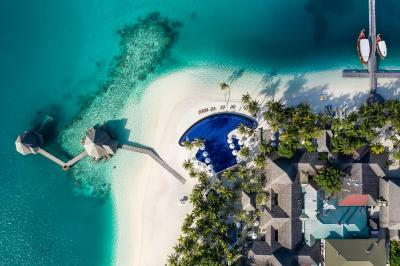 Rebuilt in 2011, villas are built over the Maldivian waters and feature ocean view baths and a private sun terrace with steps offering direct access to the lagoon. It also features a private plunge pool with water jets. Villas are furnished with glass floor panels and recessed lighting. 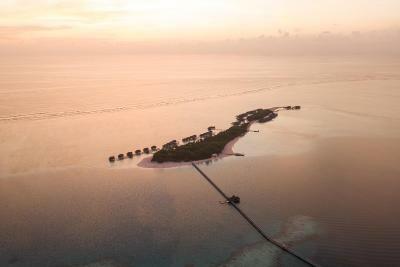 Please note, children under 12 years of age cannot be accommodate in over-water villas. Spacious bedrooms at this villa feature floor-to-ceiling windows, a large private garden and plunge pool, all just steps from the beach. It also has an open-air garden bathroom and bathing pavilion. This villa can accommodate up to 2 adults and 2 children OR 3 adults and 1 child. This villa features a hot tub on the sun deck and a bed, which directly faces the ocean. Guests can enjoy beautiful sunset views from this villa. 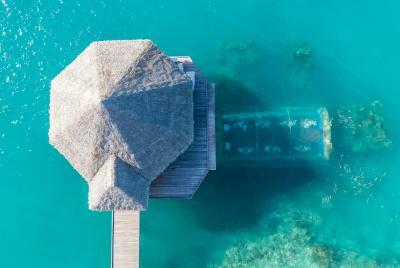 Set on stilts on a private part of the resort's lagoon, these over-water villas are clustered around the spa retreat. Each villa has its own separate spa treatment room with 2 massage beds, mini gym and medicine ball. Featuring a thatched roof and wooden interiors, the villa comes with a spacious bathroom with large dressing area with day bed, bathtub and ocean views. 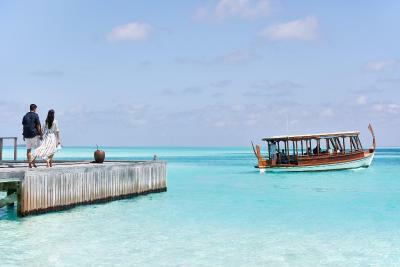 The private sundeck has a large hot tub and offers direct access to the lagoon. This villa can accommodate up to 3 adults. 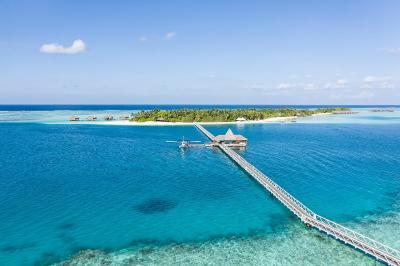 This deluxe water villa offers views of the sunset, a large outdoor color-changing hot tub and a freshwater shower on the private deck. 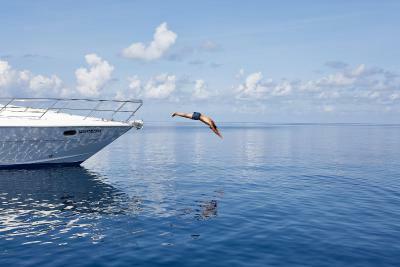 It also features a spacious living area and a large bedroom with 42-inch flat-screen TV with DVD player, iPod connection and surround sound. A Nespresso tea/coffee machine and toiletries by Aromatherapy Associates are provided. This villa has two bedrooms. The master bedroom comes with a king-sized bed, while the second bedroom comes with twin beds. The large bathroom includes a dressing area with a day bed, rain shower facilities and a bathtub with ocean views. 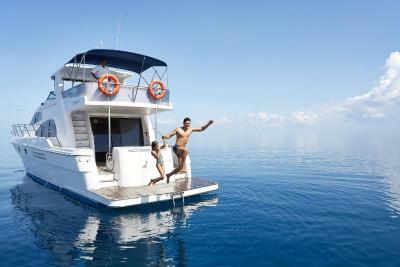 The villa also has a private deck and a large whirlpool. This family room features a seating area, mini-bar and air conditioning. This suite has a DVD player, seating area and cable TV. This family room features a flat-screen TV, iPod dock and seating area. 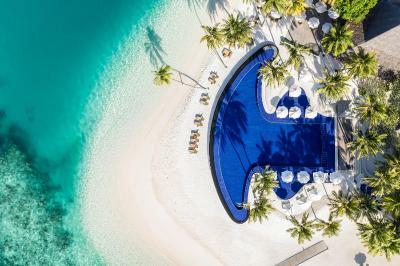 Discover barefoot luxury at the award-winning Conrad Maldives Rangali Island resort, set on two private islands among miles of idyllic white-sand beach and unspoilt reef. 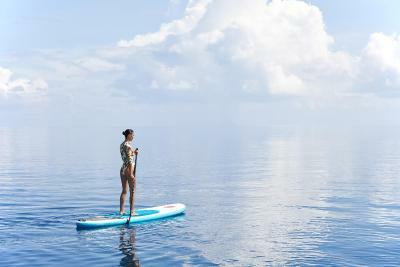 House Rules Conrad Maldives Rangali Island takes special requests – add in the next step! One child from 2 to 11 years is charged USD 100 per person per night in an extra bed. 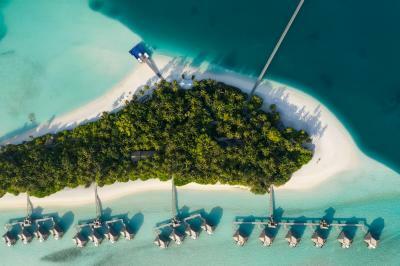 Conrad Maldives Rangali Island accepts these cards and reserves the right to temporarily hold an amount prior to arrival. 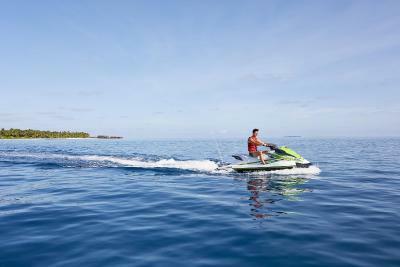 Speedboat transfer takes approximately 120 minutes from Male International Airport. 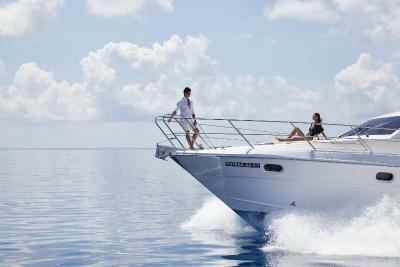 One way rates are USD 3080. 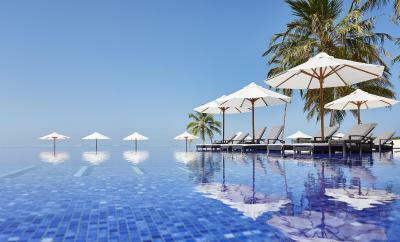 Guests must send arrival and departure flight details directly to the property at least 7 days prior to arrival. Please get in touch with the property for details on baggage restrictions. Children under 12 years will eat for free based on the rules and meal-plan accompanied by an adult, excluding alcoholic beverages. Applicable within 12 months from the wedding date and a copy of wedding certificate must be provided at the time of booking. but the prices were over the top you get tax and service on everything. 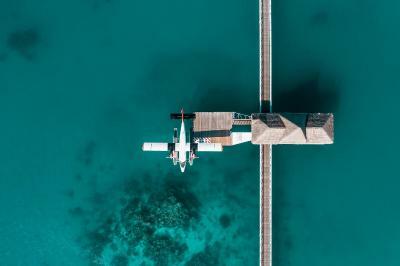 If you are going there please check seaplane, restaurants and activities prices before you book.